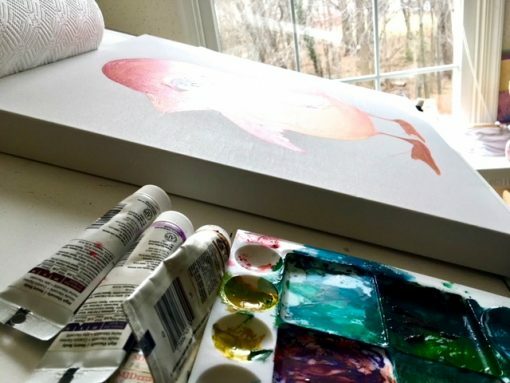 I used to day dream about having an art studio at home. I always put off creating one because I thought I needed a certain space, the perfect design and money to build it. 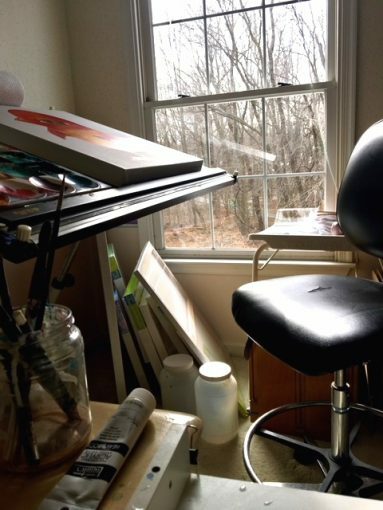 You might be dreaming about a studio of your own — especially if you see blog posts by other creatives that feature their home studios. Well, I am here with a little wake up call! Or, in the words Nike borrowed from Andy Warhol…just do it! Actually I think the words he used were “don’t think about making art, just get it done”. Either version applies here, though! There are many glamorous images in peoples minds as to what makes a great studio space. We have all seen beautiful spaces transformed into a creative studio space with dazzling white walls, industrial floors, and lots of natural light. In these photos, everything seems to have a place and everything is in it’s place. In fact, there are many HGTV shows that focus on just this topic. I let not having the ideal space at home keep me from creating art for many years before I had that “ah ha moment”. Really the main ingredient for a studio space, no matter how large or small, is accessibility. For many years I pushed back the tablecloth and worked at my kitchen table. The main reason I did this was because I had easy and quick accessibility with, of course, great lighting! Whether you stand or sit in your space is really not important. Whether its new or old, clean or cluttered, doesn’t matter. The determining factor for you should be accessibility! If it’s not convenient, you will never take the time to do your project or create when inspiration hits. You also want to be able to close a door and walk away. Working in this manner whether it be at sewing, writing or painting, will allow you to pick up where you left off. 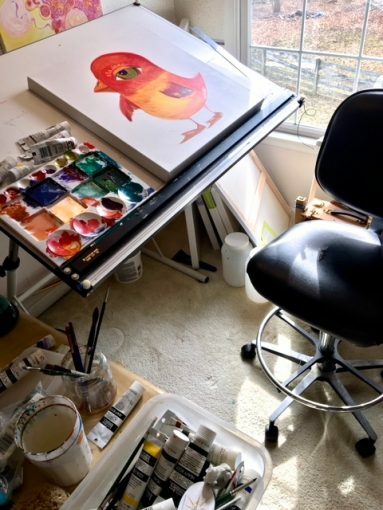 I have toured many friend’s home studios locally and found them to be everything from a small table in the attic by a window in an empty bedroom, or just a clean spot at the end of the kitchen table. We all imagine the perfect setting and think it will produce better work, but honestly it just doesn’t always exist for the talented artists that I know. If you want to start to create, find a small pocket of space and start! Don’t make excuses or hold your self back — and don’t wait for someone to go off to college either. I’m baring a little bit of my soul here, but here is my space. No judgments. Just use this post to add fuel for your fire! If your haven’t found your creative corner in your home yet, don’t worry, I have the perfect spot for you to create. Come join us at any of our workshops this February. Use this link to see all of the classes that are available. I’m happy to share my creative space with you!